If you’re visiting California’s Napa Valley or nearby Sonoma County with kids under 21, here are some fun ways to spend the day before relaxing over a glass of Pinot Noir. Be sure to check each attraction’s website, local tourist magazines and take-one local brochures for discount admission coupons and seasonal specials. Here, your family can enjoy a 1½ mile long miniature train ride with a goat-feeding stop. Open daily June through Labor Day from 10m to 5pm and orentan weekends throughout the year. Train tickets are a bargain for all ages. This sticker shop offers tours (Monday to Thursday by reservation) that teach children how stickers are made and give them a chance to play with them. There is also an exhibit of all the stickers ever made by Mrs. Grossman’s. Children under 3 free. Need a budget rental car for your Napa Valley vacation with kids? Young kids will enjoy a tour of this 23-acre farm where they can feed the sheep, collect eggs, learn about horses and rabbits and even sit on the tractor. Horseback riding is another option. When mellow vineyards start to annoy your little ones, head straight to this oasis for letting off steam. There are two 18-hole, mini-golf courses, batting cages, bumper boats with water sprayers, and a Lil’ Indy Raceway with single and double cars, so big sibs can help steer. This is the perfect afternoon diversion for the child who loves airplanes. With a variety of educational exhibits about famous aviators and the history of airplanes, the museum is also dedicated to restoring historical aircrafts and putting them on display. Stop by this kid-friendly factory/deli to learn about “curds and whey” and to sample many varieties of Sonoma Jack cheese. Pick up some lunch to enjoy in the Plaza’s part where picnic tables, swings and a duck pond make this a perfect stop. Visit the shops in the downtown area after spending a quiet afternoon on the city square. Kitschy to some, we found the Petrified Forest a charming, old-fashioned roadside attraction. Science says that an eruption of Mount St. Helena over 6 million years ago engulfed the forest in volcanic ash, removing all the water from the trees and turning the giant redwoods to stone. Well-marked trails meander through the forest so you have an up close view of trees that have fossilized over eons. Colors and crystals are still visible in the petrified tree trunks and fallen timber. Free of charge, you can enter the museum adjacent to the gift shop and learn more about this fascinating natural phenomenon. Open daily; children 6 and under free. No, this is not the famous Old Faithful of Yellowstone National Park but, as it has a regular interval pattern, it qualifies as one of three such phenomena in the world. California’s Old Faithful erupts approximately every 40 minutes depending on the moon, tides, and other natural phenomena. When you arrive, you will see a bubbling pond which will soon turn into a huge stream of water, spouting up to 60 feet, before calming down and gurgling until the next eruption. An adjoining exhibit area describes the phenomenon, and the proprietor will be happy to answer your questions and show you records on the timings of the eruptions. Open daily, no fee for children under 6. While grown-up family members indulge in vintages and varietals, children can stay equally entertained with a cooking course for ages 7-12 and 13-17. Four-day camps run throughout the summer; contact the Ramekins Inn for lodging packages on the premises. The journey of grapes from vine to wine has always been a mystery to us, so we decided to take this tour of the Mumm Napa production facility. The grapes used in the production of the bubbly are the first to be picked and it was fascinating to learn the details of the champagne-making process, done here as it is at the company’s famous France headquarters. Contrary to the image of peasants stomping grapes with bare feet, the industrial approach is to press juice from the fruit in a large machine, where every step is monitored and tested for precise specs. A remarkable robot named Bob organizes the bottles with daunting efficiency and is sure to intrigue older kids. Driven Raceway, for older kids and adults, is Sonoma’s place for European-style indoor go kart racing. In true California style, the competition-ready electric karts are not only emission free, and environmentally friendly, but they can be remotely controlled by staff to ensure everyone’s safety. Great place to teach driving skills; younger siblings can try mini bowling, black light mini golf, and more in the games arcade. Gardeners and anyone roaming off-the-beaten path will be fascinated by the story of Luther Burbank, a horticulturalist so famous that both Henry Ford and Thomas Edison came to visit his “experimental” gardens. There’s a small fee for house tours but entrance to the tranquil gardens filled with many of the innovative roses and flowers he developed is free. If your family is really into plants, drop by California Carnivores, a nursery for carnivorous plants eat insects. It’s located at 2833 Old Gravenstein Highway, Sebastopol, CA 95472. Located in Petaluma, the Marin company gives interesting factory tours with demonstrations on how their Camembert and Brie cheeses are made. They also have five acres of grassy space with picnic tables for you and your family to spend the afternoon. For families who want to introduce their children to Snoopy and all the other Peanuts characters, the two-story house museum of artist Charles M. schulz packed with comic strips and TV show clips is a treat. There is a drop-in art studio for kids to practice drawing and coloring and a labyrinth in the shape of Snoopy’s head. Next door is Snoopy Home Ice, an ice skating arena; and the Warm Puppy Café where you can try a grilled cheese or tuna sandwich (Mr. Schulz’ favorite). His characters, so famous for so long, are still remarkably fresh and irresistible.Real fans can look for the 150 statues comprising Peanuts on Parade, five-feet-tall characters playing throughout the city of Santa Rosa. In Wine Country, you will find sheep, llamas, honeybees and butterflies, and even pet bunnies being raised in those quiet acres beyond the vineyards. Using your free Farm Trails Map or their online directory, you can inquire about hands-on activities like tasting the farm’s cheese, watching demonstrations, milking a cow, or seeing baby lambs being born. Most farmers sell organic produce, and it’s also available at the daily Green Markets which move from town to town. We recommend you plan to picnic in conjunction with a Green Market visit because they are usually set up in a town square or park area with public seating. During the appropriate season, you can join daytrips to pumpkin patches, corn mazes, and Christmas tree farms that offer hayrides, haunted houses and animal petting. In any season, kids will enjoy visiting the many berry, fruit and vegetable farms open to visitors; check out the online Farm Trails guide or pick up free, widely available maps and look for working farms nearby. 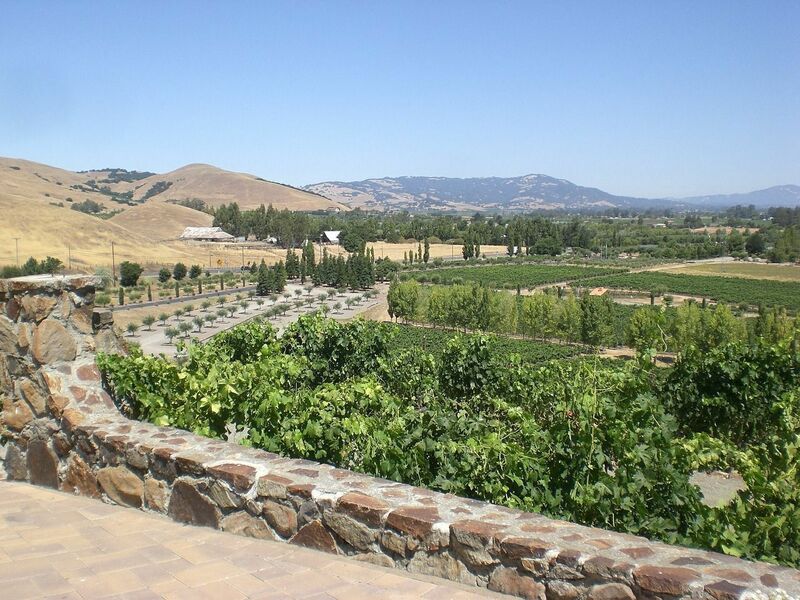 There are several kid-welcoming wineries in Sonoma such as Sebastiani and Buena Vista. Others recommended for families traveling with under-age drinkers include Benziger, Ravenswood and Chateau St Jean. But the Coppola Winery with its large pool, sundeck, outdoor cafe and movie-memorabilia-infused wine shop and museum takes family entertainment to a whole other level. Some of the fun is free; all day passes for the pool cost $20 per person but usually sell out early. Instead, book their Cabine Package ($125 for four) and you’re guaranteed poolside sunchairs, souvenir water bottles, and wine tastings. Check their website for the current season’s pricing. From the mid-1700s to almost 1820, Spanish Missions were built along California’s El Camino Real spanning 650 miles from San Diego to Sonoma. Best known is the Mission San Francisco Solano de Sonoma, circa 1823, popularly called the Sonoma Mission. The goal of many history-buff roadtrips in northern California, it is the last of 21 missions at the end of “The King’s Highway.” Other National Historic Landmark sites and buildings include the Plaza, the Sonoma Barracks, and the home of the Mexican commandante, General Vallejo. At the nearby California Missions Museum (707/939-8051), the missions are commemorated by scale models made by European artisans. We haven’t tried it but we hear parents can have a relaxing and delicious ride aboard the Napa Wine Train during a roundtrip excursion from historic downtown Napa. Choose to dine or eat lunch in a 1947 Pullman Vista Dome Dining Car, fully restored Pullman Dining and Lounge railcars dating from 1915-17, or an open air Silverado car. Check their schedule for Family Fun Nights, when parents can relax with a gourmet dinner, while kids ages 3 to 12 play games, watch movies and enjoy a free meal under the supervision of a professional caregiver in a separate railcar. Need a place to stay in the wine region? Check-out InterContinental’s Kids Eat Free programs for the summer. You can also rent a discount car through Priceline for your drive through Napa, Sonoma and beyond. For ideas on active, outdoors adventures in this beautiful region, please visit the FTF Guide to Outdoors Adventures In California Wine Country.